Boylecasino.com offers fans of betting games a casino experience with a difference. Visitors to its website are greeted with an array of high quality games as well as an exhaustive list of entertainment options available. The casino which was founded in 2007 is owned by Boylesports Alderney Ltd and is licensed by the Alderney Gambling Control Commission. Players will be pleased to note that a wide range of payment options are accepted including major credit and debit cards. Boylecasino.com features games created by the gaming software giant, Playtech which has become a byword for innovation and cutting edge graphics and sound effects. Its catalogue is divided into sports betting, casinos card games, poker and slots and feature themes inspired by popular culture, history and adventure. This impressive collection of about 250 games is constantly being improved upon and examples of new additions which have been introduced include: Go Bananas, Wild Safari, Robojack, Attraction, Jurassic Park, Elements, Jackpot Cherries, and Lost Island. All games come in downloadable, mobile and browser versions. A unique feature of Boylecasino.com is the Risk Free All Games offer in which clients can earn back 100% of their losses up to £/€20 in lieu of a welcome bonus. Additional promotions and special deals include: Slots Cash Back (which enables clients to win back up to 20% cash back on their overall losses when they play any slots on Monday, Tuesday and Wednesday), the Last Man Standing roulette tournament which provides participating players with the opportunity to win £/€5000, the Weekly Rewards scheme in which clients can win up to £/€250 playing their favourite games and the Tuesday Raffle in which clients must stake £/€10 or more every Tuesday to enter our Random Raffle for a chance to win a cash prize. The Alderney Gambling Control Commission (AGCC) which regulates the activities of Boylecasino.com is renowned for its strict monitoring procedures which meet the highest international standards. Under its supervision, the virtual gaming establishment is constrained to adhere to standards which ensure that its activities promote fair and honest gaming. As a result, its clients are protected from any fraudulent or criminal practices and can enjoy their favourite pastime within a safe environment. Boylecasino.com employs cutting edge security methods to maintain the integrity of its site and protect it against possible security breaches. It also makes use of a state of the art firewall and ensures that financial transactions are processes using encrypted connections. The casino also protects clients’ information ensuring that it is not passed on to third parties. Boylecasino.com mainly caters to clients from the UK, Australia and Canada. The casino does permit clients from Bulgaria, Cyprus, Estonia, Hong Kong, Israel, Netherlands, Norway, Switzerland, Spain, Turkey or the United States, to make use of its website. Boylecasino.com’s members’ area provides clients with all they need to indulge in its impressive offerings. Clients have immediate access to the sports, casino, slots and poker sections. They can also view their balances and make payments, while also obtaining information which has been provided on existing bonuses and promotions which they are eligible for. Access to customer support is also provided. Boylecasino.com permits a wide range of payment methods including major credit and debit cards and popular electronic payment methods. Examples include MasterCard, Visa, Visa Electron, Maestro, PayPal, Neteller, Euteller, Clickandbuy, Paysafe, Ukash and Sofort. Boylecasino.com’s multi-tiered loyalty system enables players to win one comp point for each €10 deposit made. Thus clients earn more points which enables them to reach higher levels in the scheme which in turn ensures that they enjoy more beneficial conversion rates for their points. There is no expiry limit for comp points which have been won and they can be exchanged for money once they have been accumulated in sufficient amounts. Boylecasino.com has a minimum deposit limit of €5 and a maximum withdrawal limit of €50 000. Different games also contribute different percentages to a client’s wagering requirements with slots and scratch cards contributing the most at 100%; Roulette contributes 20%; Video Poker and Baccarat provide 10% while pontoon, black jack and red dog contribute 5%. Additional information on these contributions can be obtained on http://ww1.boylecasino.com/help/. Players who have any complaints and enquiries are encouraged to contact Boylecasino.com as early as possible and with as much information as possible in order to ensure a prompt and satisfactory resolution. Various methods of communication with the customer care team include live chat, telephone and email. Boylecasino.com’s ability to provide games of exceptional quality across various platforms and exciting tournaments and promotions has enabled it remain at the forefront of the online gaming industry and maintain the loyalty of a large number of customers. The quality of its customer care has also been praised for being friendly, professional and highly efficient. One possible drawback however is the fact that its website is only available in English which may deter casino gamers who do not possess a sufficient fluency in English from enjoying the exciting entertainment it has to offer. Boylecasino.com is a highly popular online casing which welcomes clients from Europe and utilises Playtech’s high quality software for its games catalogue which consists of 250 games and is available across different platforms. 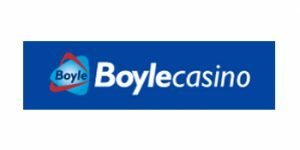 Boylecasino.com accepts payments from major credit cards as well as e-wallets. It also provides regular promotions and tournaments at which players can win impressive sums. It is dedicated to ensuring clients enjoy a safe and entertaining experience and is regulated by the Alderney Gambling Control Commission to ensure that it maintains relevant operating standards required. It also provides efficient customer service and clients may contact its regulator and licensor in the event of being dissatisfied with the outcome of an enquiry.